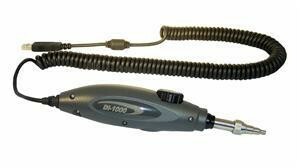 The ergonomically designed DI-1000 is Lightel's all digital video microscope probe. It connects directly to your PC through the computer's USB2.0 port. Featuring easy single finger focusing, a built-in image freeze/capture button, and detectable resolution to 0.5µm, the DI-1000 package includes our free ConnectorViewTM (standard) software, providing digital zoom, image display, image capture, auto-calibration and basic analysis tools. The DI-1000 uses Series 2 inspection tips and can also use all our CI-1000 tips with an optional adapter. Our optional ConnectorView Plus analytical software adds Pass/Fail analysis and detailed reporting capabilities to the DI-1000.